• The next generation of office papers. • Non stop print. Excellent machine performance in the most demanding high volume copier and laser machines. • Eco-efficiency. Efficient use of resources. Less wood, water and energy consumption than a standard 80gsm paper. • 100% satisfaction guaranteed. We are so confident of Discovery quality as to provide a 100% satisfaction guarantee. 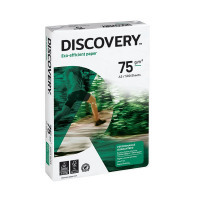 If for any reason Discovery does not meet your expectations, the replacement of the product is guaranteed. A smooth white, everyday printing paper for non-stop high-volume print runs. Even sided and multi-purpose, it gives trouble-free printing on copiers, laser printers, inkjet printers and plain paper faxes. 75gsm in weight, this A3 paper has a better performance than standard 80gsm paper. This paper is supplied in a ream of 500 sheets.